Sassenachs, catch up on this week’s Outlander news, including Season 3 premiere details, new cast interviews, BTS images, and more! Sassenachs, if you’re like me, the fact that we’re in August inspires opposing feels. I’m so not ready to say goodbye to summer; however, this means September 10 is right around the corner and Outlander will always be a silver lining! This week, we got several teasers and goodies leading up to Outlander‘s third season, including news of premiere events for fans, behind-the-scene images, new interviews with cast members, and more! First, STARZ announced that they will be having events in Los Angeles AND New York City to help fans usher in Outlander Season 3. On Tuesday, September 5, STARZ is hosting three advanced screenings of the third season’s premiere episode at Pacific Theaters at The Grove (5pm, 7pm, and 9pm PT). Tickets are first come, first served, starting at 10am PT that same day. In addition, there will also be fun Outlander activities, including a replica of the A. Malcolm Print Shop, photo booth, tea-leaf readings, and much more! Then in NYC, also on September 5, Entertainment Weekly is hosting a red carpet premiere event and advanced screening. Following the episode, there will also be a panel discussion/Q&A with Caitriona Balfe and Sam Heughan. A limited number of passes WILL be available for fans to attend, however, they’re only available for EW subscribers (registration starting August 21 at 12p ET), as part of their A-List series of subscriber-only events. 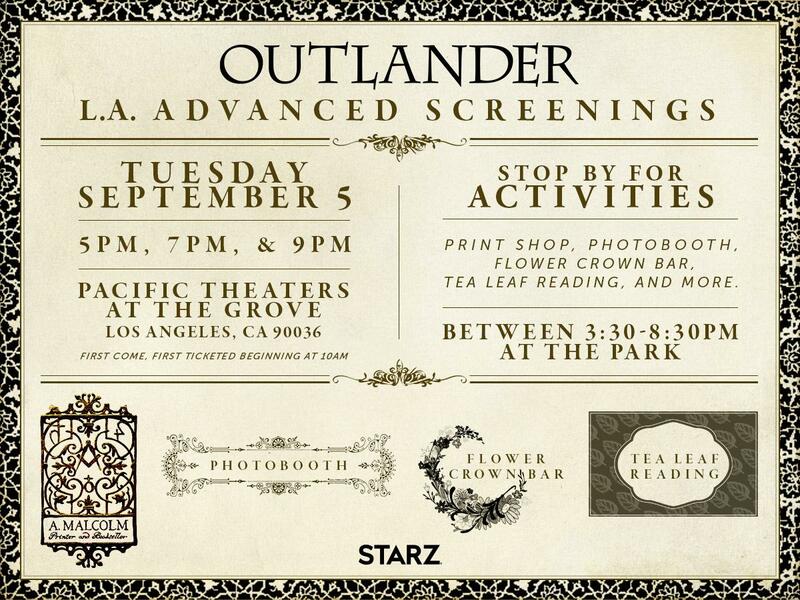 Go HERE for more information about joining A-List Online and attending the Outlander premiere event. This week, STARZ has shared a couple more inside looks at Season 3. On Instagram, they shared this BTS image of Sam Heughan shooting a scene. Slight ***SPOILER ALERT***, but this looks like the time where Jamie is hiding from the Red Coats in the forest outside of Lallybroch. On Twitter, Outlander gave us a visual look at how the show is translating the book (Voyager) to the screen. This features a scene between Claire (Caitriona Balfe) and Bree (Sophie Skelton), where Claire shares advice she received from Mrs. Graham about learning to leave the past in the past. *SIGH* I can’t imagine Claire’s fear. I mean, it would be exciting to find out that Jamie survived Culloden, but the process of searching through history with no further assurances would be so stressful! There have been a series of new interviews with our faves in the Outlander cast! Entertainment Tonight sat down with Sophie Skelton and Richard Rankin (Roger Wakefield) on-set to talk about how their roles continue to develop in Season 3. They talk about how interesting its been to enter this Outlander world, film scenes that take place in the 1960’s, and “massive developments” in the Bree/Roger romantic relationship. There are also several brief scenes from the upcoming season, like Bree growing up with Claire and Frank in Boston. Leanne Aguilera from ET also chatted with César Domboy, adult Fergus, and they play a game of “Would You Rather”. It’s a really adorable interview, where César reveals he’s proud of his French heritage, likes tattoos, and plans to live forever! 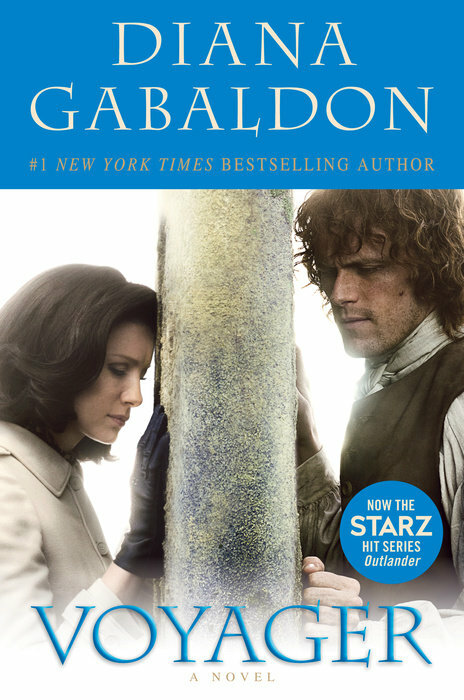 Finally, the STARZ tie-in edition of Voyager is on sale now! Go HERE to buy your copy from your favorite bookseller. Are you planning on attending any of the Season 3 premiere events? What are you most looking forward to in the upcoming episodes? Share your thoughts in comments and stay tuned to We So Nerdy for all your Outlander news!